Reiie Bluetooth Car Kit exclusive 1-button ensures your safe journey, thus you can spare more time to concentrate on the road. Still figuring out the function of numerous buttons? Say "NO"
Time to choose a safe car kit.Plug and pair, press or rotate. Then enjoy hands-free phone calls,crystal clear music while still focus on driving. The latest Bluetooth 4.1 technology enables crystal clear music, stable wireless phone calls. Support 2 smart phones connected simultaneously, you can listen to music or answer calls from either one. Bluetooth car kit will power on if you plug the Bluetooth adapter into USB port and reconnect automatically with the previously paired device. Reiie Bluetooth car kit owns the all in 1 button makes everything simple. Playing, pausing, previous or next songs,answering or rejecting calls only to press or rotate the knob. Reiie mission is to provide a pleasant online shopping experience and friendly customer services to every customer. 【SAFE PHONE CALLS】 Plug & pair. Enjoy hands-free phone calls,crystal clear music from phone via the latest Bluetooth 4.1 technology in this stereo Bluetooth receiver for car. 【AUX PORT ONLY】Route audio through the 3.5mm AUX input to Stereo while listening to music and dealing with phone calls. Make sure that your car equips with aux input, otherwise cannot be used. 【EASY SETUP EASY USE】Time to get rid of Bluetooth car adapter with numerous buttons. Reiie Bluetooth adapter owns the unique 1-button makes everything simple. Playing, pausing, previous or next songs,answering or rejecting calls. 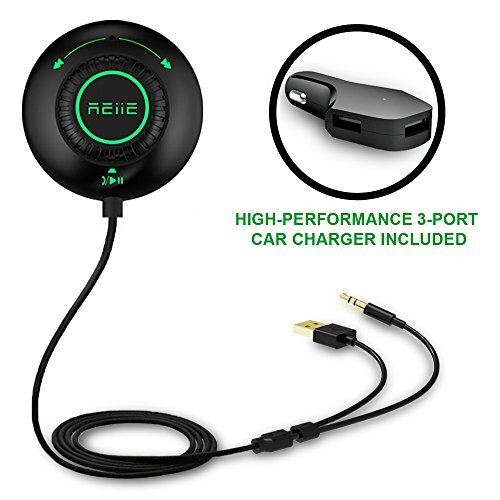 【DUAL CONNECTION】Reiie Bluetooth stereo receiver for car is designed to connect with 2 Bluetooth devices simultaneously, allowing answering phone calls and playing music from either one. 【100% SATISFACTION】We are pleasure to provide full satisfaction with our REIIE Bluetooth Car Kit. Offer 30 days guarantee, 1 year warranty and friendly customer support. BONUS: If buy bluetooth car kit now, add the Dual car charger to your shopping cart and input promotion code before you pay, then 2 kinds of car charger you got.. More details click "Special offers and product promotions". Buy it with confidence!